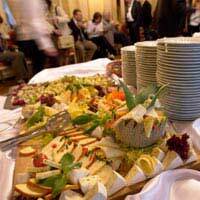 Many caterers find that their work is sporadic at certain times of the year. Much outside catering is undertaken at the weekends. By having regular weekday business it will fill the gaps when contracts are low on the ground and also give a boost to turnover. Mark a circle on a map 3 – 5 miles from your working base. Pinpoint all the industrial units, factories and office buildings within the circle. Ask yourself where the workers purchase their lunch? Yes, some will bring in their own packed lunches and perhaps a few larger employers will have canteen facilities but for many workers they have to go out during their lunch break and purchase food. If you could deliver pre ordered food to the workplace would this not help them as well as your catering business? What sort of food does a worker require? Office staff may have a lighter lunch; female staff are often watching their weight. Manual workers need something more filling and some people just want a bar of chocolate. Design a menu that doubles as a flyer for your business. Make it clear that orders are taken during the morning (or the previous afternoon) and delivered by midday. Start simple, do not offer too many sandwich fillings as it will be too much work to begin with. Bowls of salads, interesting rolls and perhaps cakes and pastries and soft drinks could be offered. Why not try cold food that can be warmed in the company’s microwave oven? Curry and Rice, pasties and pies, all these will attract buyers in the colder months. Indicate that there is a delivery charge unless it is a group delivery. Try to have a designated person in each business that collects the money and sends you the order each day. You could even ring them for the order and advice about any specials for that day. Work in a methodical order delivering flyers that show your menu and service. You do not want to be dashing all over the place when delivering so start with one industrial estate or office block at a time and then move to the next in the area. You will have a small window in which to deliver the food each day, usually between eight and twelve so time is of the essence. A website showing your food delivery service will enhance your business and draw in passing traffic. Link it to your other catering services to promote yourself further. Send weekly emails to each business showing what meals you can offer for the coming week. Why not offer a birthday cake service. So many workers celebrate their colleagues’ birthdays and to be able to deliver a cake or a selection of cakes to order would add to your turnover. What about specialist chocolates and a selection of birthday cards for those workers than have forgotten a loved one’s special day and have no time to shop? Many companies have meetings and visitors so offer a special menu targeted to management that means they do not have to leave the building for lunch. Sandwiches and rolls on platters. Hot pastries and other finger food along with napkins and paper plates will add to the appeal of the service. When delivering to each company take along a small selection of sweets, drinks and savouries for impulse buyers and those that have not ordered. Thank you for the informative articles your website. Clear and straight to the point. Lots of good ideas to work with. Continue in the good work.